Set in its own purpose-built studio, Blaze combines cardiovascular training with strength, boxing and martial arts skills to give an intense workout. Watch our video to find out more. It's new, unique, like nothing you've experienced before and it's exclusive to David Lloyd clubs. 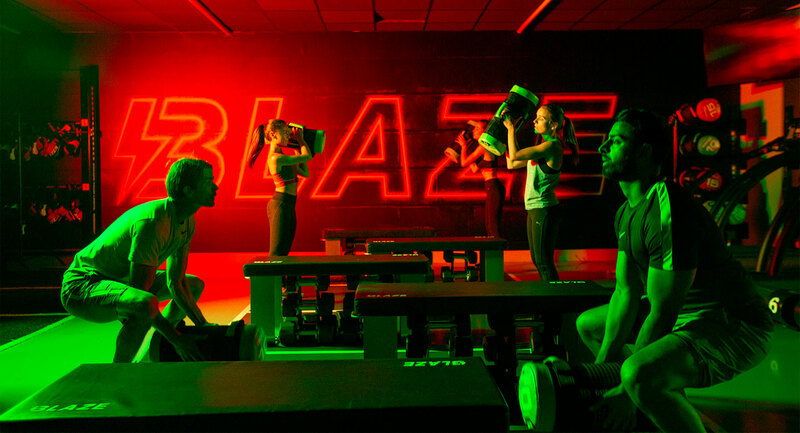 Blaze is a HIIT class that will test your strength, stamina, and willpower as you run, lift and fight. It will push you to your limit. Make your way round the different stations as light, sound and energy power you through your workout while our instructors challenge you to achieve results you never thought possible. Plus, a Myzone heart-rate belt will track your performance so you'll work your body at the right intensity. Myzone is a wearable heart-rate based system that guarantees accurate and personalised results to help you make the most of your workout. It monitors heart rate, calories and time exercising and converts the results into Myzone Effort Points (MEPs) – so the focus is on rewarding effort rather than fitness. Your Myzone stats are projected onto digital screens in the form of colour-coded, easy-to-read tiles, so you can keep track of your progress throughout your Blaze session! There’s also the free Myzone App, making it easy for you to stream your activity, upload your data and review your results from your smart phone.